Colombia Solidarity Campaign Launches Report "LA COLOSA: A Death Foretold"
London-based human rights organisation Colombia Solidarity Campaign has published an Alternative Report about La Colosa, the AngloGold Ashanti gold mining project in Colombia’s municipality of Cajamarca (Tolima), entitled La Colosa: A Death Foretold. The report unveils, for the first time, findings which clearly show that if the production phase of the La Colosa gold mine goes ahead, its implications to local communities would be much graver than previously anticipated. Community leaders and human rights defenders are already paying the highest price – their lives – for their opposition to the large-scale corporate mining project. This report is a result of extensive research that included more than 100 interviews on the ground, legal document analysis, and technical assessment by Dr. Mark Muller, a highly respected international expert on mining. AngloGold Ashanti is a company listed on the London Stock Exchange. Foreign investors are favoured over local communities when it comes to distributing precise and timely information regarding the mine’s development. A strategy is identified whereby AGA permeates the media by funding advertising space, and sponsoring events that attract media coverage. AGA’s Corporate Social Responsibility programmes are dividing the local community, creating dependencies, and conveying the perception that AGA’s activities are environmentally-friendly. 50 hectares of the La Colosa project is located in a páramo area, a highly valuable ecosystem. La Colosa would produce 100 million tonnes of waste rock, which would be deposited in valley-fills in Cajamarca, with a high probability of generating acid mine drainage. The tailings dam, where highly toxic residue would be stored, would be among the largest in the world, with a maximum embankment height of 250 metres. La Colosa would require more water and electricity than the minimum domestic consumption of the whole Tolima department (population: 1.4 million). 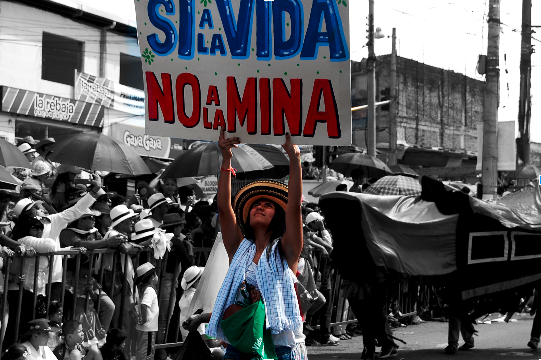 “Anyone who opposes mining at the moment is a persecuted person” — Carmen Sofia Bonilla, former director of environmental authority of Tolima. Numerous cases of harassment of people who oppose the mine have been documented. Harassment continues with almost complete impunity due to the lack of political will of the Colombian state, as well as AngloGold Ashanti’s political and economic power in the country. Following the assassination of campesino community leader César García, there is grave concern for the safety and security of other leaders in the region. A new “exclusion” of the Central Forest Reserve where La Colosa is located was silently granted to AGA in May 2013. Local communities only found out about it two months later. More than half of the current members of Cajamarca Council have had direct or indirect financial links with the mining company, which constitute conflicts of interest. People who peacefully oppose the mining project have been characterised as “fundamentalists”, people who are “against development”, or even “terrorists”. Despite promises of a better life, the residents of Cajamarca have been adversely affected by higher costs of living, a marked increase in prostitution and violence, and change in the use and ownership of land. There are reports of a tense working atmosphere in the mining project, marked by fear of losing one’s job. Colombia's conflict minerals: re-inventing the "terror wheel"?